August | 2012 | ___is black the new black? Doesn’t that look awesome? It always puzzles me when fork over money for pesto when it’s the easiest thing in the world to make. This particular batch, I made using a recipe from Bon Appetit. I made a few changes: reduced the salt to a 1/4 teaspoon, added some lemon zest, and just used parmesan, oh, and used 3 garlic cloves instead of two. 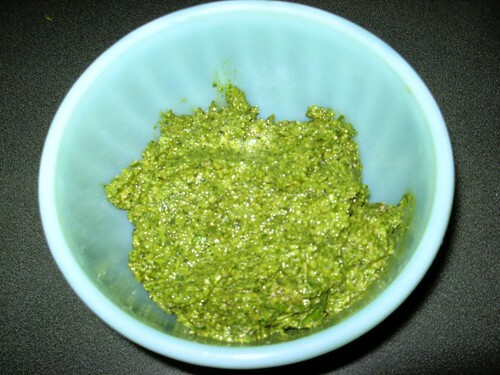 Basically you put most of the ingredients in a food processor or a blender then add the rest and you have instant pesto! The trouble with pesto is that in a day or so that brilliant green will turn brown It will still taste good, but it doesn’t look so appetizing. Also, a little pesto goes a long way. So I freeze mine. Purists will tell you not to put the cheese in if you’re going to freeze pesto, but I usually do anyhow. I used to put things like this in little containers. Then I came across this storage solution somewhere. 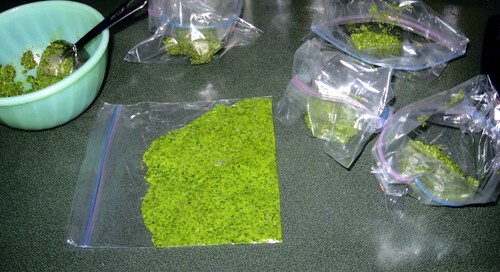 I take ziploc bags and fold over the top part, add a quarter cup of pesto and then carefully smoosh out the pesto so it’s flat and thin in the baggie. I do this with tomato sauce too (note: make sure the sauce is at room temperature. Melted plastic bags are no fun). Then all you need to do is put each baggie flat onto a cookie sheet. 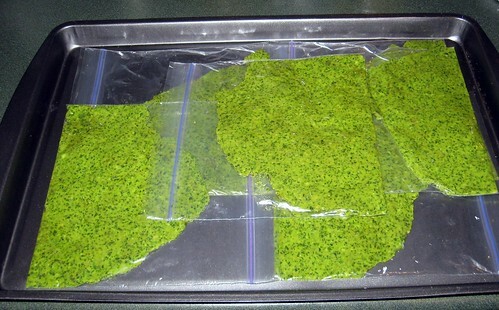 Put the cookie sheet in the freezer until the pesto freezes. Stack the baggies flat and you will be saving oodles of room. When you want to use the pesto, you can thaw it or you can generally open the bag and put it on the hot pasta and stir it in. I’m a power user of Goodreads, which is a seriously awesome social networking site for books. For a long time now I’ve been looking for an similar site for movies and really, if there’s anything comparable I haven’t found it. And then in a post somewhere deep in Goodreads, I heard about SeenTh.at. It’s a bit clunky, but they have a feedback function and it’s coming along. For a movie lover, I think this is worth your time exploring.